Is this goal of the week? Watch as Taylor Adams slots an incredible goal from the pocket. 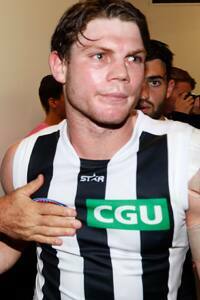 Taylor Adams enters the rooms after winning 33 disposals in Collingwood's win over Brisbane. Is this goal of the week? Taylor Adams has been rewarded for his major from the forward pocket with a Goal of the Year nomination. Early in the third quarter, with his side leading by 57 points, Adams found himself on the end of an Adam Treloar kick out of a pack. Tight on the boundary line, Adams judged his kick to perfection, sliding the ball over the line from 45 metres out. It was one of 18 kicks Adams had for the night, to go with his 15 handballs, three tackles and four rebounds. To vote for Adams, head to goaloftheyear.afl.com.au now and get behind our vice-captain.